This square is my second contribution to the Mystery Lapghan Crochet-a-long, a crochet event featuring thirty-six 6″ (15 cm) squares by thirty crochet designers. This post contains affiliate links. The yarn for the sample was generously provided by Red Heart. You can read more about the CAL here, or join the Facebook group to chat with participating crocheters. You can find my first pattern for this CAL, the Diagonal Box Stitch Square, here. I wanted each of my square designs for this crochet-a-long to be a little different. Since the last one was crocheted in rows, this one is crocheted in rounds. The last one used two colors, so this one uses three colors. The last one was easy, and this one is a bit more… interesting. You see, the Raised Bunchberry Square is dimensional. It also features several special stitches. Since I want crochet-a-long to be fun for crocheters at all different skill levels, I included photo tutorials for the special stitches. I also asked three fellow designers to check out the pattern. They used some great colors in their versions! I can’t wait to see what your version looks like. Don’t forget to share a picture on Ravelry or with my Facebook page if you make one! If you want an easy print format, you can buy an ad-free PDF version on Craftsy. The Craftsy version includes two files – a pattern only version and a pattern with tutorials version. You can choose which one to use and print. This post includes the pattern only. For the pattern with photo tutorials of the special stitches, visit this post. A raised center makes this floral granny square stand out. Red Heart With Love (100% acrylic, 7 oz/198 g/270 yds/338 m) – 1 skein ea in 1001 White (CA), 1538 Lilac (CB), and 1801 Navy (CC), or approximately 32 yds (29 m) in ea of 3 colors in any medium weight yarn. US Size I-9 (5.5 mm) crochet hook or any size needed to obtain gauge. Finished square in pattern = 6” (15 cm). Exact gauge is not critical for this project. beg-cl – beginning cluster – Ch 3 in sp, (yo, insert hook in same sp, yo and draw up a loop, yo and draw through 2 loops) twice, yo and draw through all 3 loops on hook. cl – cluster – (Yo, insert hook in sp, yo and draw up a loop, yo and draw through 2 loops) 3 times, yo and draw through all 4 loops on hook. FPsc – front post single crochet – Insert hook from front around back to front of cl in previous round, yo and draw up a loop, yo and draw through 2 loops, sk st behind FPsc. * Rep after asterisks as indicated. First Round of pattern is worked on the wrong side. Turn to right side for Round 2. For all future Rounds, join to right side. Shop for Crochet Motif and Granny Square patterns, booklets, and books on LeisureArts.com. With CA, ch 4, sk 3 ch, join with sl st to first ch to form ring. © 2015 by Marie Segares (Underground Crafter). This pattern is for personal use only. You may use the pattern to make unlimited items for yourself, for charity, or to give as gifts. You may sell items you personally make by hand from this pattern. Do not violate Marie’s copyright by distributing this pattern or the photos in any form, including but not limited to scanning, photocopying, emailing, or posting on a website or internet discussion group. If you want to share the pattern, point your friends to this link: http://undergroundcrafter.com/blog/2015/10/21/free-pattern-raised-bunchberry-square. Thanks for supporting indie designers! Thanks, Irma! Do share a picture if you make one. 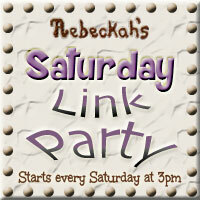 Thanks for stopping by, Joanita, and for hosting such a fun link party!